Q: Is that possible to choose a render engine for the flash flip pages? 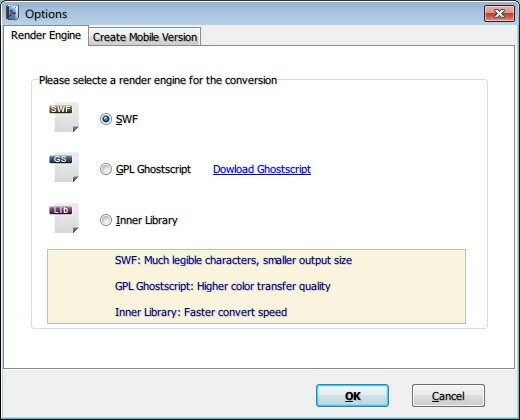 You must know that using different render engine makes different effects to a Flash file, which means if you want to make a very high quality flash book, you must use right render engine. Though you can choose output quality of the book with PDF to FlashBook, if you require a better effect, we suggest you to choose render engines. So, how to choose render engine? Let’s figure out. Click “Options->Application Options” to open an option window. Inner Library: Faster convert speed.